Be part of a dynamic brand and claim a premium price for your product! All you have to do is commit to growing healthy product in an approved pot with a Burpee tag and displayed with POP. Review the Burpee Grower Guidelines. 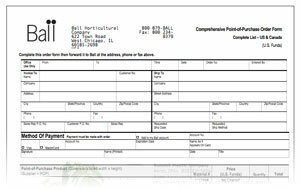 Then contact your Ball Seed or ColorLink sales rep to help you become a Certified Grower in minutes! Fill out this form to cement your status as a Certified Burpee Grower. Have questions? Contact our program administrator. The Burpee royalty rebate program means you pay royalty ONLY for tags on plants that sell. Royalty supports program marketing and drives customers to the garden center. We'll give you all the tools you need to grow your business using the Burpee brand. Download this document to learn how to get started. 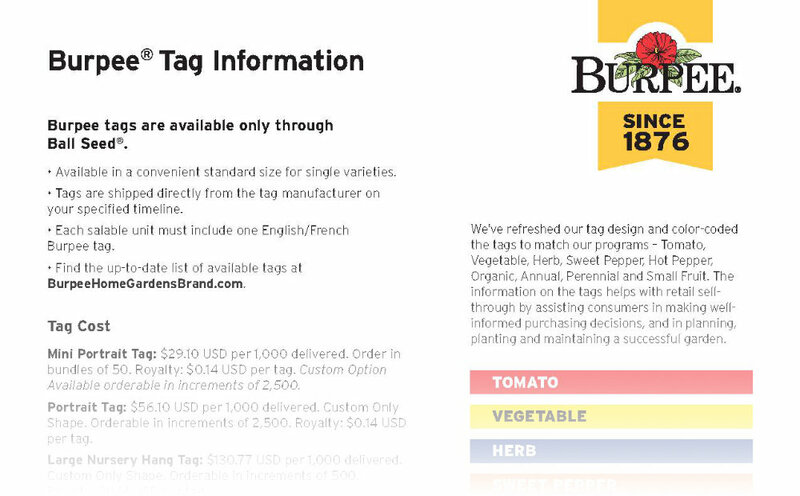 Our distinctive tags are reminiscent of Burpee seed packets — just like gardeners saw on their mom's kitchen table. Easy take-home planting and care tips in English, Spanish or French assure gardening success. Branded and sustainable pots are available through preferred suppliers. Learn more about your packaging options here. Download the comprehensive point-of-purchase product order form here (U.S. and Canada).